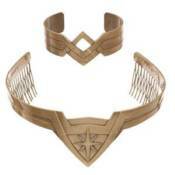 No Wonder Woman costume is complete without her iconic tiara and bracelets, and her new cinematic adventure provides the beautiful designs for this set of Amazonian accessories! Slip them on and feel the power and majesty of the world's greatest superheroine. Just add some Amazon battle armor and a magic lasso, and you'll be ready to take on the worst that Man's World can throw at you! WONDER WOMAN: WAR OF THE GODS SOFTCOVER WONDER WOMAN: WHO IS WONDER WOMAN?